National parent center that enhances the quality of life and expands opportunities for people with and without disabilities. What If Your Child Is the One Doing the Bullying? originally appeared on Babble.com. One in four children in America is bullied each year, according to the National Center for Education Statistics. Bullying is a serious issue that can impact a child's grades, erode self-worth, and lead to long-term emotional and mental health issues. Ask any parent who has been through it: seeing your child become the target of bullying can be heartbreaking. But what if your child is the one doing the bullying? This news can come as a shock to parents and reactions vary greatly. Denial is a common initial response - "Not my kid!" - followed by confusion - "How could this happen?" But eventually, the reality sinks in, and that's when the question becomes, "What should I do?" Parents can start by rejecting stereotypes and labels. Not everyone who bullies is an intimidating giant towering over a small, defenseless child on the playground. That might sell in Hollywood, but reality is quite different. He is just as likely to be an honor-roll student. She might be the quiet girl who sits in the back of the class. There is no laundry list of characteristics that describe a person who bullies. Bullying happens everywhere and involves all types of kids: urban and rural, big schools and small, rich kids and poor, every race and religion. It's characterized by an imbalance of power between the child who bullies and the target of bullying. It can be physical, verbal, emotional, social, or sexual. It's just as likely to occur via text, email or social media. If you learn that your child is bullying others, you need to look into the situation immediately. Remember, however, that bullying situations can be complicated, and your child may be the target of bullying at the same time. Fortunately, behavior that is learned can also be unlearned. Here are some steps you can take. 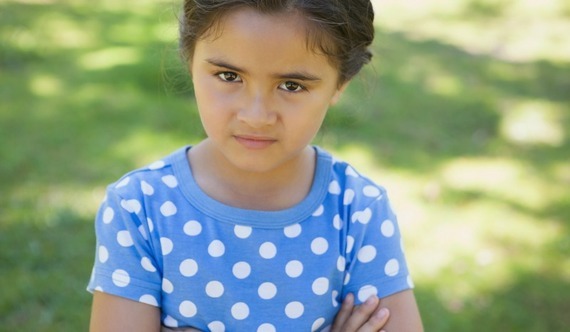 Children may not recognize their behavior as bullying, and may not realize how it is impacting another child. Help your child understand what bullying is, and let them know that it is not OK under any circumstances. 2. Find out why your child is bullying. Ask how they are feeling and try to figure out if peer pressure is playing a role in the situation. Look into whether or not the bullying behavior is intentional or whether it's the result of an emotional, behavioral, or physical disorder. 3. Develop an action plan. Behavior can be changed, but it won't just happen without intervention. Find out what actions need to be taken, and then determine who should be involved (teachers, school social worker, administrators, etc.) and work together on solutions. It's important to keep the lines of communication open with the school and other parents. 4. Provide clear and consistent consequences for bullying. Hold your child accountable for their actions. Be specific about what will happen if the bullying continues and find meaningful consequences, such as loss of privileges or activities. When your child handles conflict well, find positive ways to provide praise and recognition. Young children learn from adults, and we need to think about our own behavior, too. Teach them about kindness and empathy. Help your kids learn different ways to resolve conflict and deal with anger, insecurity, or frustration. It takes time to change behavior, and there are bound to be setbacks along the way. Be patient and supportive, and involve others in the process. Coaches, faith leaders, and psychologists, for example, can be invaluable. Bullying was once considered a childhood rite of passage and a normal part of growing up, but perspectives have changed as parents and educators have become more aware of the long-term consequences, and organizations like PACER have helped raise awareness. PACER's National Bullying Prevention Center has excellent online resources for families and educators. Visit PACER's KidsAgainstBullying.org for resources for elementary school children, including a section called Do You Bully? PACER's TeensAgainstBullying.org website has tools and resources for middle and high school students.